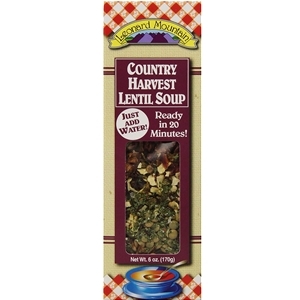 Leonard Mountain Country Harvest Lentil Soup is a great combination of lentils and seasonings. Great in the slow cooker! Reduce heat and simmer 20-30 minutes or until lentils are soft. Variation: try adding a can of tomatoes and one pound of ground beef. Simmer on high for an hour. Set to low for 6-10 hours. Lentils, dehydrated vegetables, parsley, chopped onions and good seasonings.